Bring STEAM to life with 3D printed objects, Spark curiosity and engage the entire classroom with the MakerBot Replicator Mini Compact 3D Printer. The MakerBot Replicator Mini+ Compact 3D Printer is an easy-to-use compact 3D printer for everyone. The MakerBot Replicator Mini is just right for smaller spaces such as college dorm rooms, classrooms, multi-workspaces, and the home. The MakerBot Replicator Mini offers fast and easy one-touch 3D printing. It has a maximum build volume of 4(L) x 5(W) x 5(H) inches and offers plug-and-play features. It is optimized for speed, has a build plate that requires no leveling, and produces an up to 400-micron layer resolution in prints. 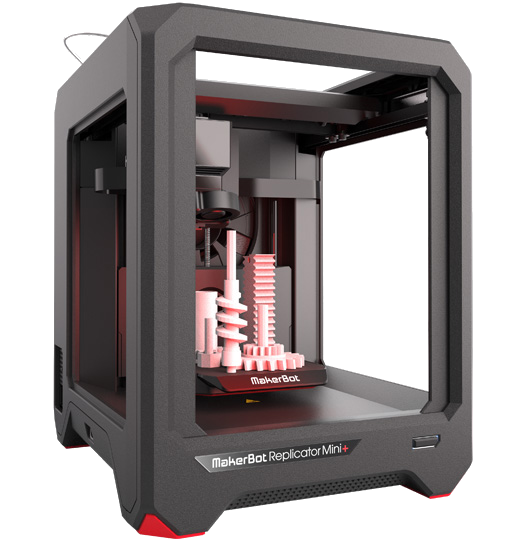 The MakerBot Replicator Mini+ offers fifth generation technology that MakerBot believes defines the new standard for ease-of-use, quality and reliability. It is optimized for MakerBot PLA Filament and offers downloads of free MakerBot Verified and ready-to-print 3D models from MakerBot's 3D design community. Perfect for educational use. Educates students how to think, imagine, create, craft and print in 3D, while preparing them for the jobs of the future.